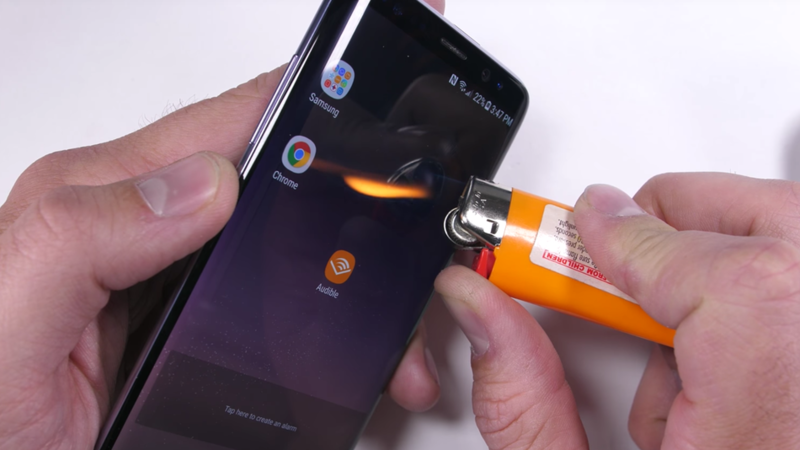 Samsung Galaxy s8 models are now available in markets and its latest durability test has just shown that it’s surely much more durable than any other smartphone in the market. We all know that Samsung Galaxy S8 has a 5 feet drop durability along with water resistant feature. But, did you know that it cannot be burned, scratched or bended? A video on YouTube just showed how amazingly developed smartphone Samsung Galaxy s8 is when it is tested online how the phone will resist during various tests. Those test includes a flaming test, bended test and scratch on the glass test. Galaxy s8 has the glass on both front and back side of the smartphone – something which hasn’t been offered ever before. So, having a scratch less phone is essential and the South Korean giant has just given its users what they highly desire. This video is courtesy of JerryBigEverthing a YouTube channel; during this video he his brand new pre-ordered Galaxy S8 smartphone. During the video he will scratch the Galaxy s8 glass front and back along with other metal parts. After that he will try to burn the screen of Galaxy s8 and at last try to bent the smartphone. The phone will pass all the test and it’s quite a painful torture video for a smartphone lover. Only test it sort of failed is scratch test – But he had tried very hard which means Galaxy s8 can be scratched if applied the firm pressure. However, there are no doubt about the reliability of Samsung Galaxy s8 hardware features. The only concerns from team TechJost are related to its software features. There are many undesirable software’s in s8 and Samsung’s digital assistant Bixby also not fully functional. Now there’s three digital assistants in Samsung Galaxy s8 models – Google now, Google Pixel and Bixby. There’re also various undesirable features like too many email features, default android apps and Digital assistants, which makes its software substandard if compared with iPhone 7 or Nexus models. The official price of Samsung GALAXY S8 models in United States market will start from $720. It will be available from 21st April 2017 in all Samsung U.S stores. It’s worth every bit of the wait and if you haven’t changed your smartphone for a while – It’s time to grab this amazing thing.